I’ve had a number or clients express interest in patterns like this recently. A faux-finish or marbleized pattern. 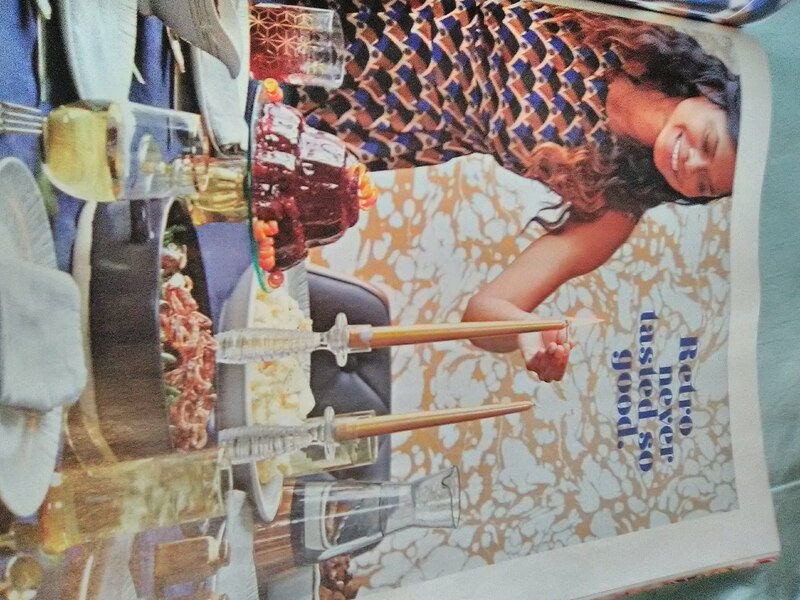 I didn’t realize that this was a hot decorating trend, until I saw it in a nation-wide magazine. This is a nice backdrop pattern. Nothing to jar the eye or steal the show … Just an easy pattern in a muted color scheme. A perfect backdrop for business or home. Well, here’s something different and fun. 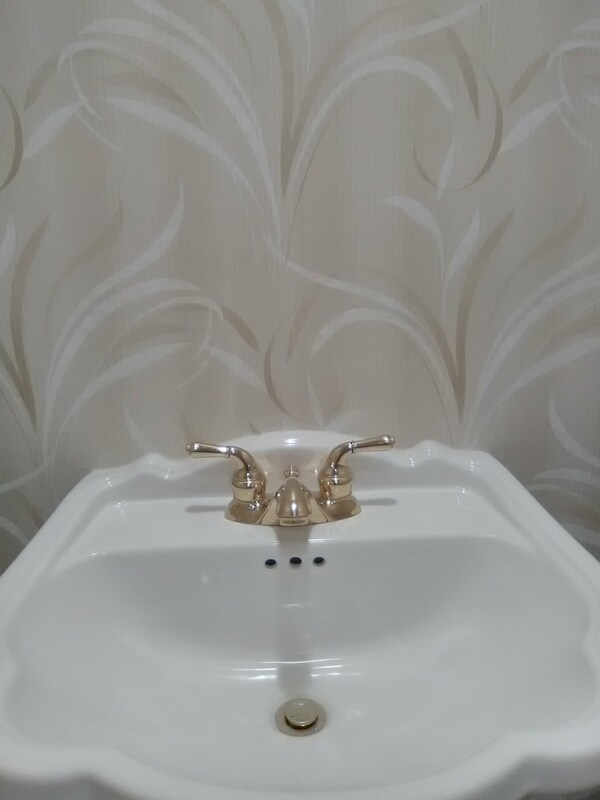 The Montrose area (Houston) home has a very earthy, eclectic feel, and this wallpaper pattern is the perfect compliment. The colors and texture are perfect with the bathroom tile and iron sconces, and the small scrawls of writing and numbers add just a touch of edginess. 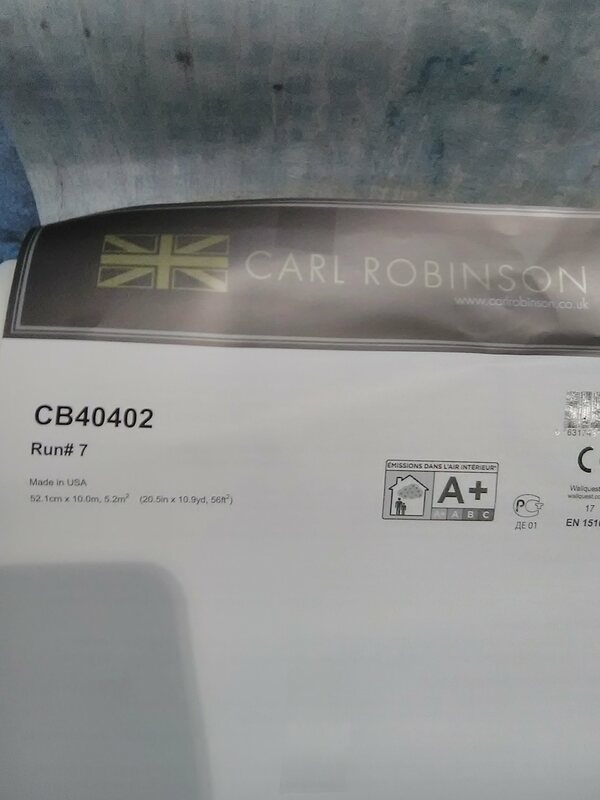 This paper is by Carl Robinson, a British company that is distributed by Seabrook here in the U.S. 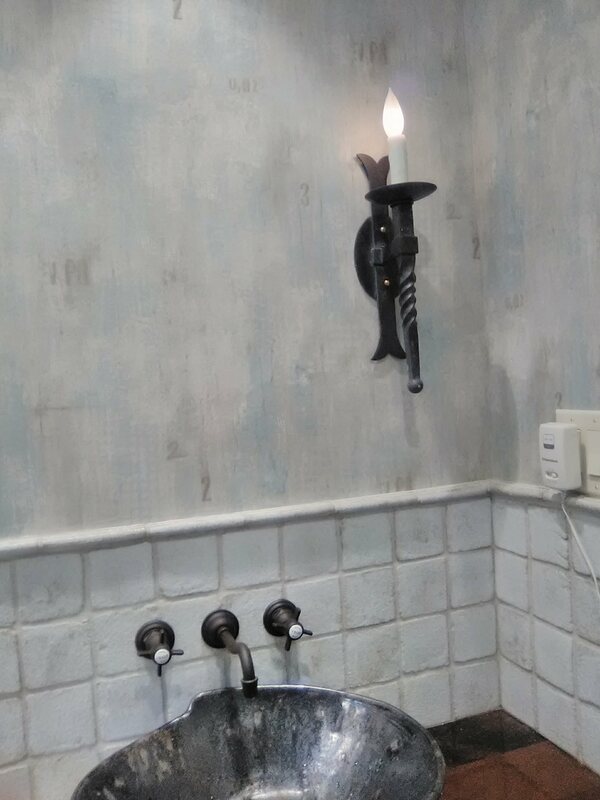 It is a non-woven material and is intended to paste the wall for installation, but I chose to paste the paper, for various reasons, most of which had to do with the two light sconces that could not be removed from the wall. Made the job a little tricky. See that top photo? This newborn baby was doomed to a boring, blaagh, unstimulating nursery. But Mom wanted more for her first-born son. Pastels and teddy bears wouldn’t do it. Mom found this innovative design in an un-baby-like color – and, boy, does it look great! In the top photo, I am in the process of applying smoothing compound to a textured wall. Once dry, it will be sanded smooth and then primed, making it ready for wallpaper. I hung this in a new home in the Bridgelands area of Cypress / Katy (Houston). 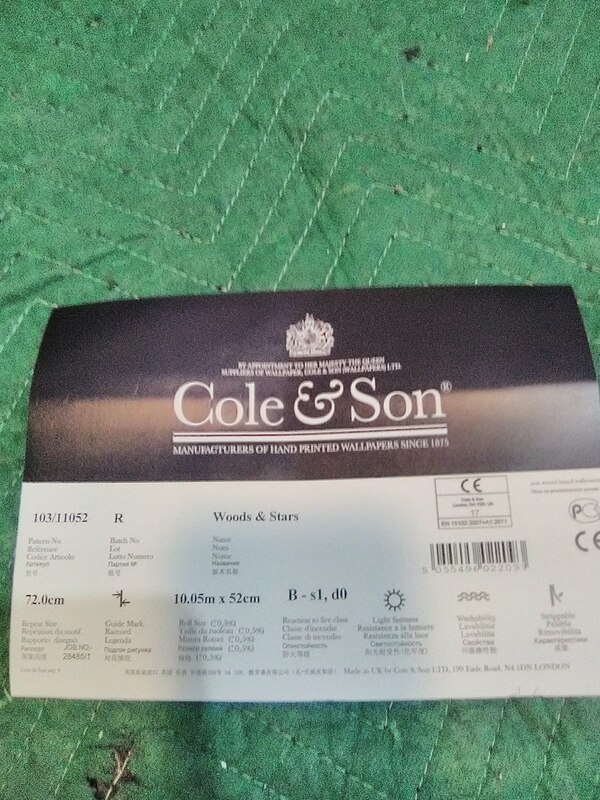 The manufacturer is Cole & Son, a British company. 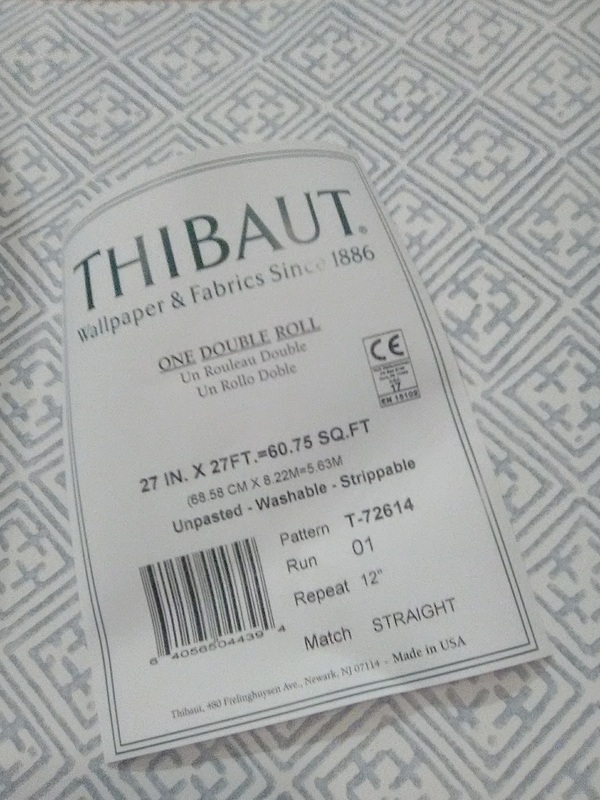 It is a thick, fairly stiff non-woven material. 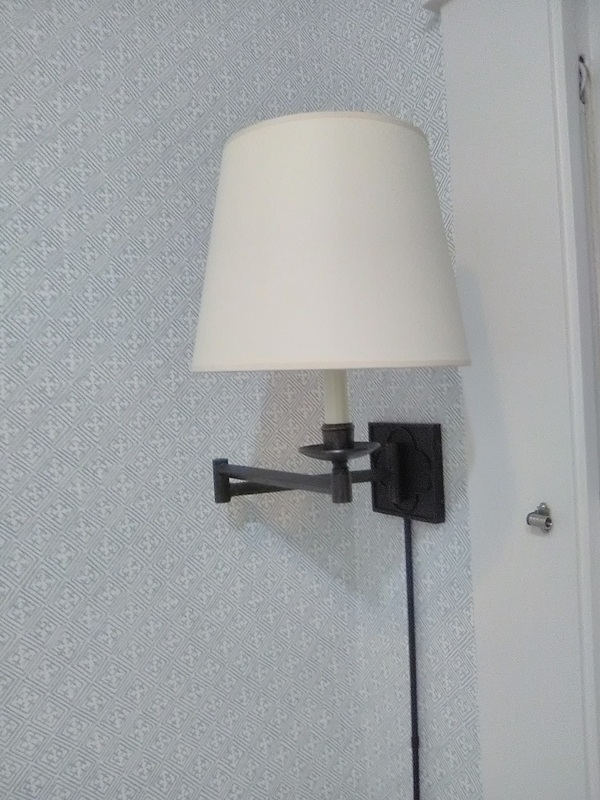 It is intended to be installed with the paste-the-wall method, and it works nicely for single accent-wall projects like this. 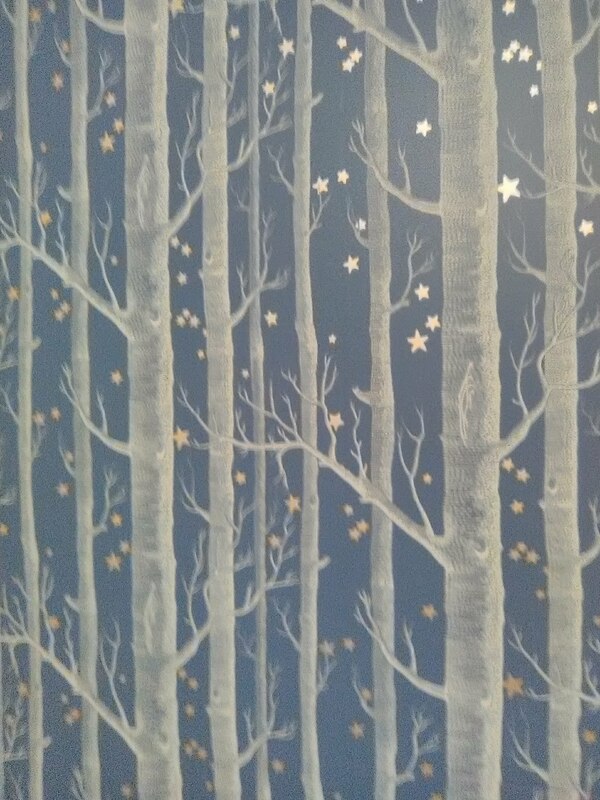 I don’t have a finished-room shot of this baby’s room, but, as you can see, the crib accent wall looks fantastic. I like this matt-finish charcoal blue color much better than the more common black-on-white designs I have seen. And the gold stars really amp up the appeal. The “Paper “Tiger” – A Horrible Tool ! 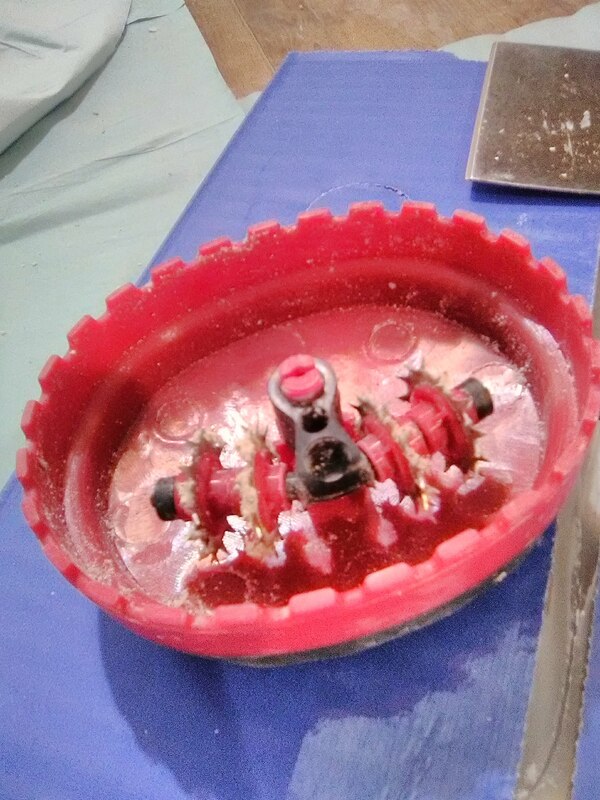 Photo #1 – top view. People who go on-line to research “how to strip wallpaper” might be duped into buying this gadget. And I even know paperhangers who use it. But, folks, it is HORRIBLE. It will wreak severe damage on your walls. It will make your removal project much more difficult and time-consuming. STAY AWAY! The concept is sound. 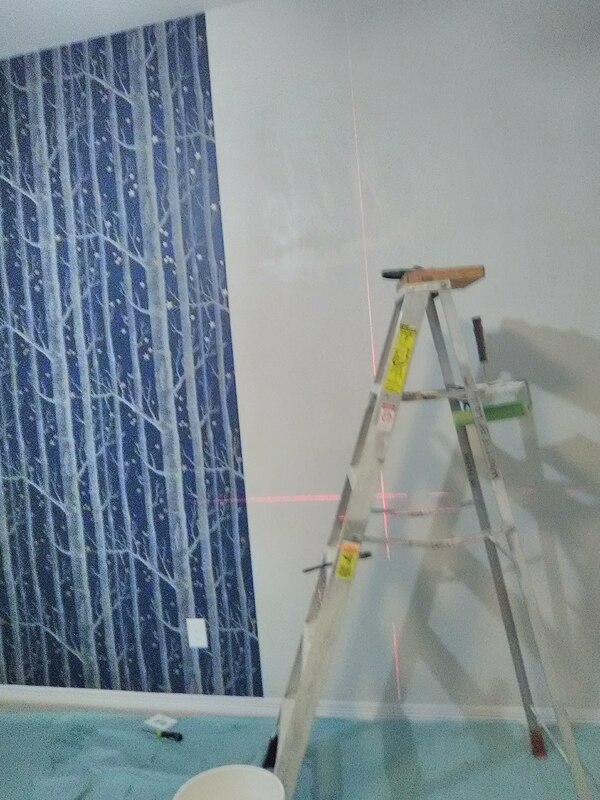 If you perforate the surface of the wallpaper, water can penetrate it more easily and then soften the paste on the back, allowing you to remove the wallpaper. 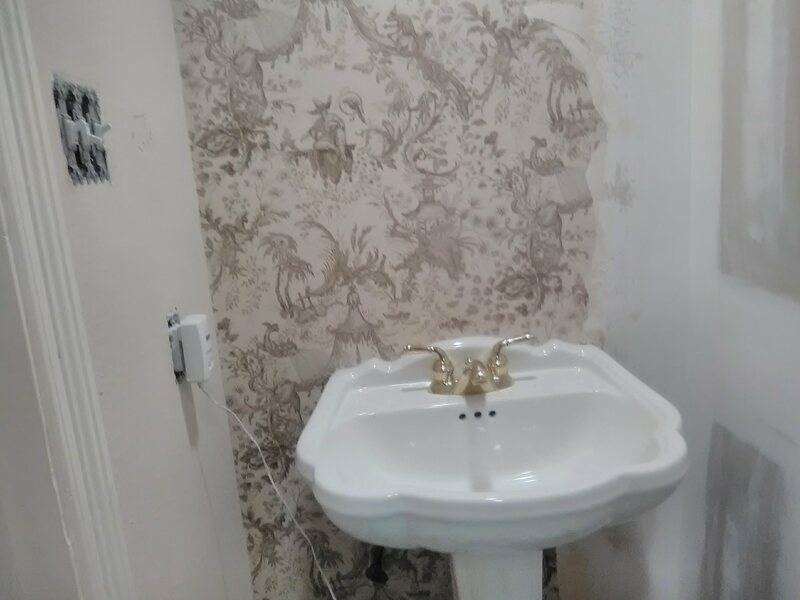 The main problem, though, is that virtually everyone presses too hard, and then the tool’s teeth dig into not just the wallpaper, but into the drywall, causing severe damage that will require difficult and time-consuming repairs. The other problem is that this gadget will cut your wallpaper into tiny pieces. That means that when you go to remove the paper from the wall, you will be scraping off, and then picking up off the floor, a gazillion 1/2″ micro-bits of wallpaper. 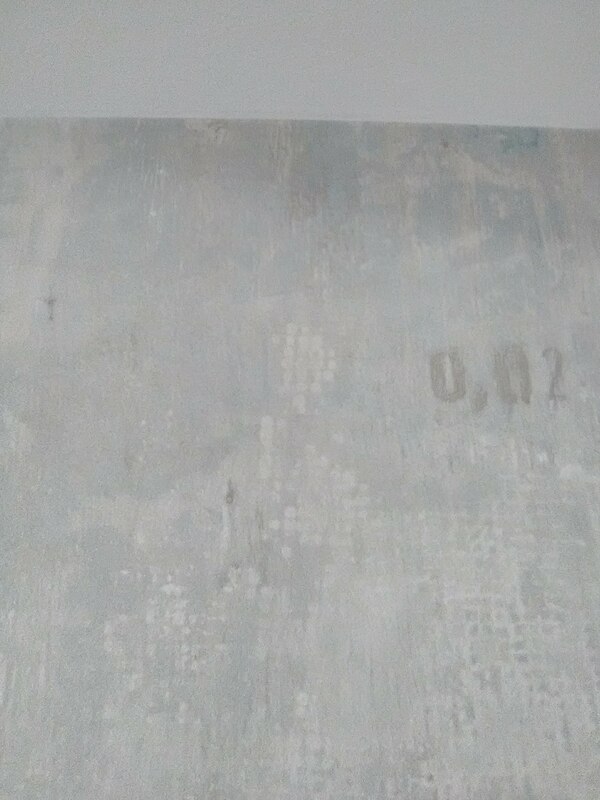 Basically, all that’s needed to strip off old wallpaper is to remove the top, inked layer, which will leave a backing layer on the wall. 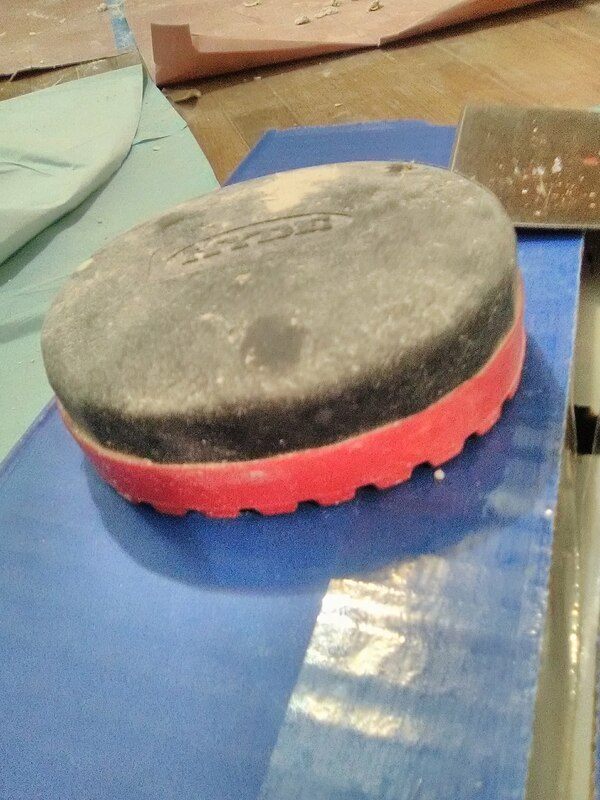 Then all you do is use a sponge to apply clean water to the backing. Over and over again. Until the paste underneath has been sufficiently softened that you can either pull it away from the wall, or gently scrape it away. No damage to the wall, no muss, and nice big pieces of paper that are easy to collect and put in the trash. 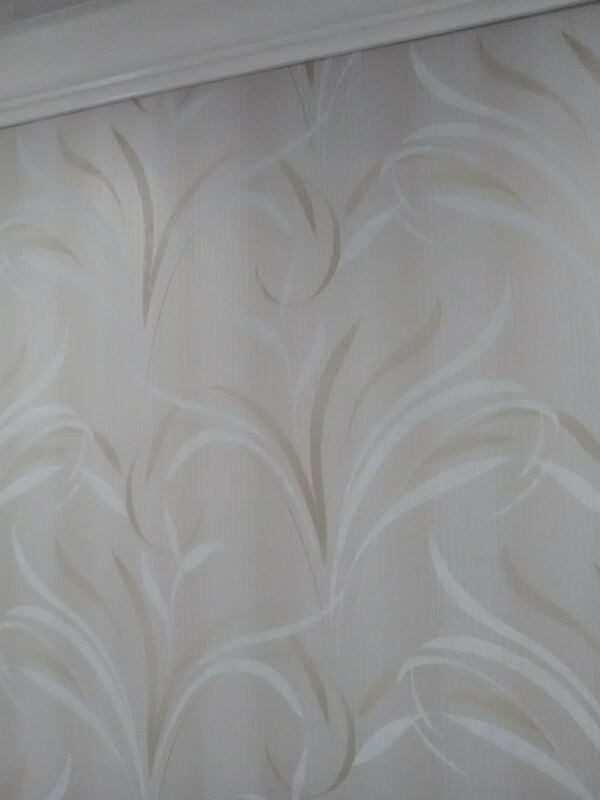 You can clearly see the mildew on the wall that was revealed when I removed the wallpaper. It shows up as the black rings / circles. The mildew was caused by moisture trapped in the wall by both a leak in the roof or siding, and a leak from a bathroom that crept under the floor – compounded by being trapped inside the wall by a solid vinyl wallpaper that would not breathe or allow air to pass through. 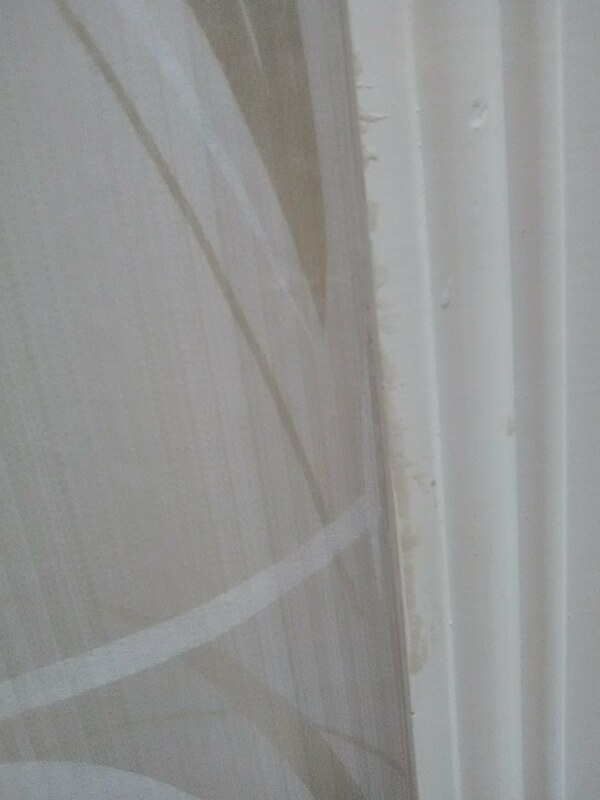 Another reason to avoid paper-backed solid vinyl wallpaper. Note: This issue was with mildew. Mildew is not nearly as dangerous as mold. Still, the homeowner took the contractor’s advice and had the drywall completely removed and replaced. 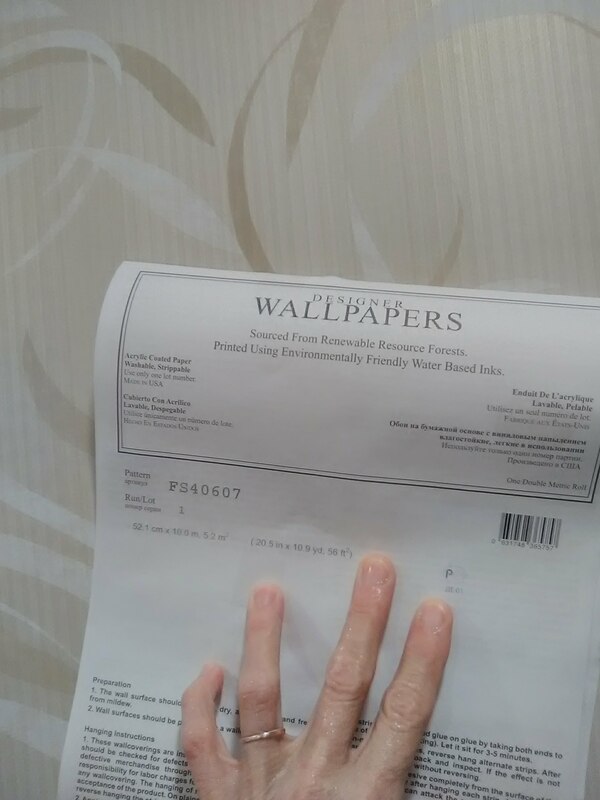 Many people these days are wanting textured wallpapers. But one problem with textured materials is that, once you step away from them, you no longer see the texture. The next time a client bring up the idea of a textured paper, I’m going to suggest a small pattern, similar to this one. This pattern is by Thibaut Designs, # T-72614. These homeowners’ home was damaged by flood waters in Hurricane Harvey. 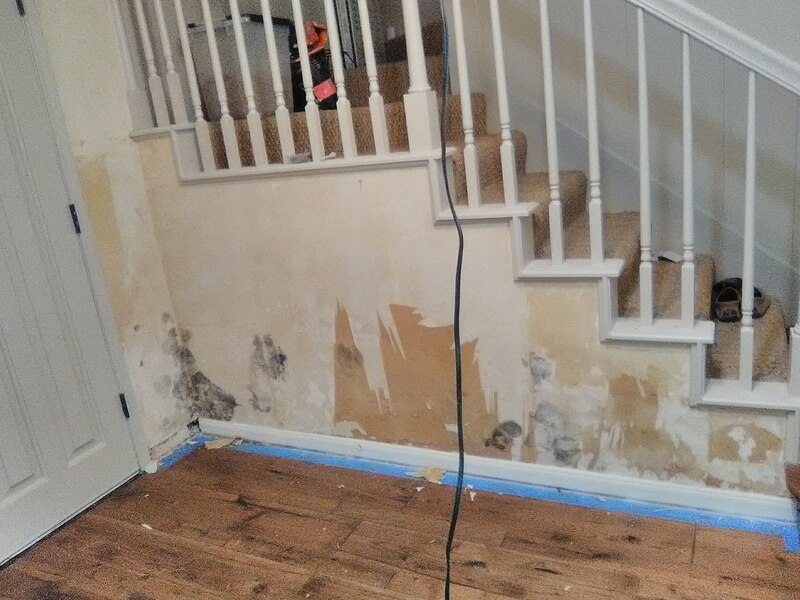 The wallpaper, drywall, and flooring in their Bunker Hill area townhome had to be ripped out and replaced. After repairs, that means that everything in the room is new. Drywall, paint, sink, toilet, floor tiles, etc. It would be nice if people could KEEP everything looking new. The homeowner asked me not to use the sink, because she already had to clean up messes left by the painters. dings” are small, but they are visible. And they are sooo easy to prevent. All you need is a drop cloth. 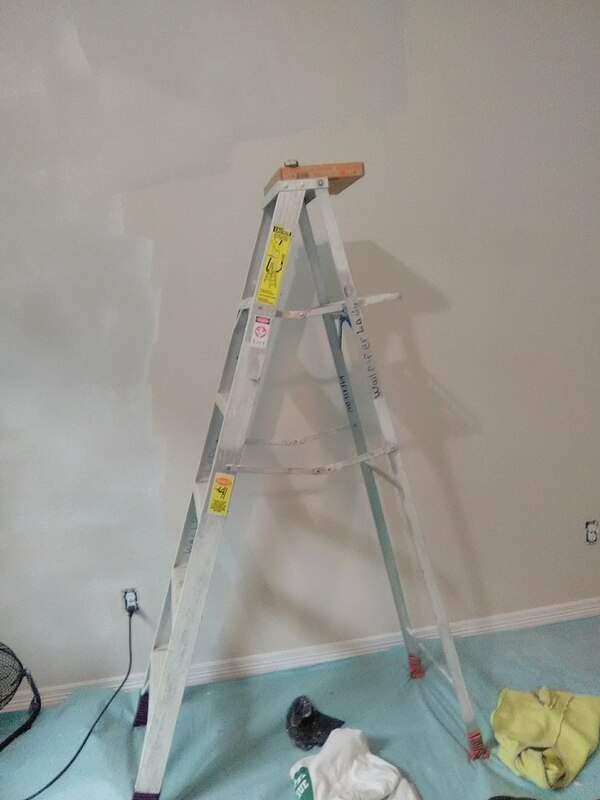 In addition, I like to tack an 18″ width of absorbant dropcloth fabric along the top of the baseboard, to prevent any spills or splatters from hitting the woodwork or the flooring. 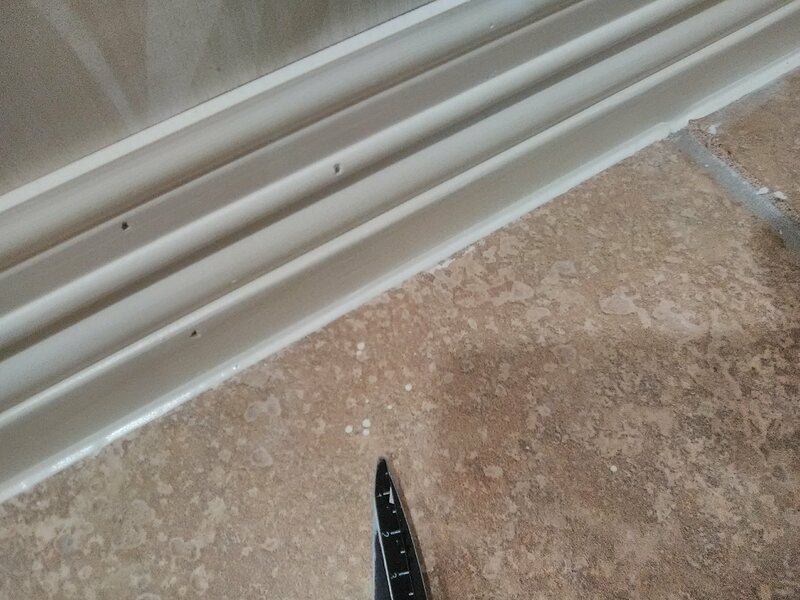 It takes very little to protect a homeowner’s moldings, floor, and countertops. 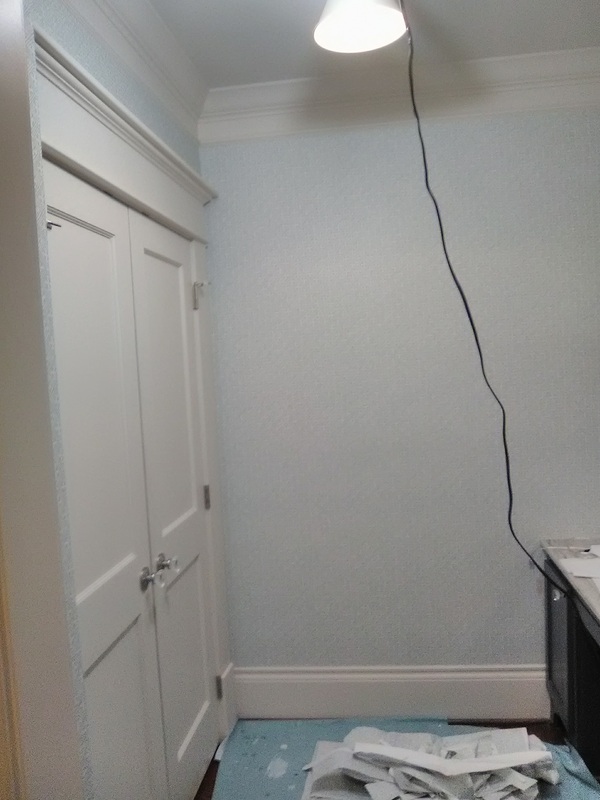 This powder room in a townhome in the Bunker Hill area of Houston was affected by flood water damage from Hurricane Harvey. 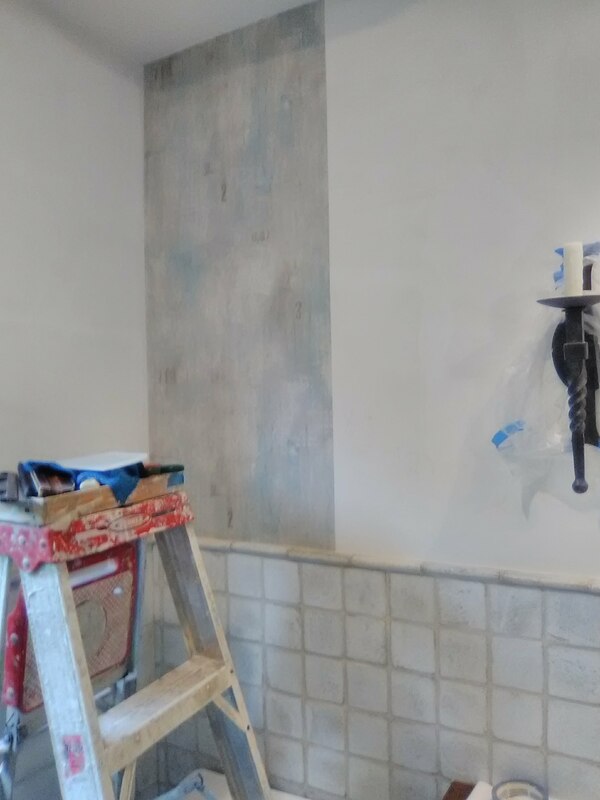 Contractors replaced two walls with new Sheetrock. 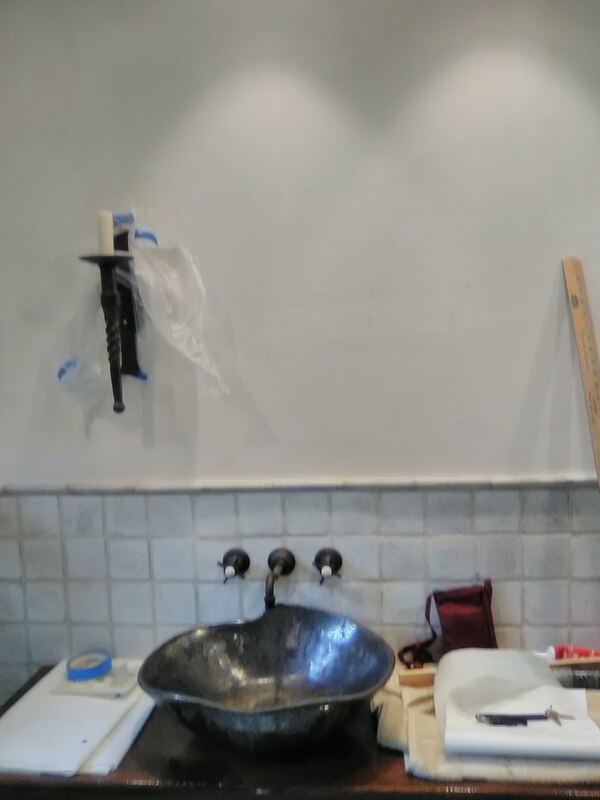 But the sink wall remained intact (top photo) and needed to be stripped of its original wallpaper, then skim-floated, sanded smooth, and then primed, before wallpaper could be hung. In addition, there were two other walls that needed to be smoothed and primed. Fixing damaged walls also gives homeowners a chance to update their décor. The Chinoiserie pattern in the top photo is fine. But after the re-do, the homeowners wanted something more modern and in keeping with a more vibrant lifestyle. See the second photo for their new take on style! This is a small under-the-stairs powder room with no window, and the ceilings are less than 7′ high. The upward movement of the wallpaper pattern, coupled with the swoopy design of the foliage, sweep your eye up, and add dimension to the walls. The pearlized color further helps visually expand the space. 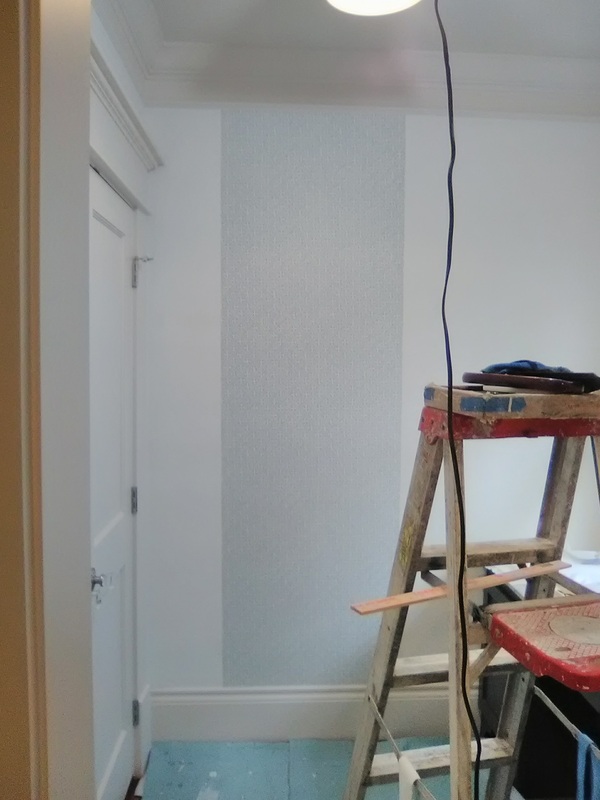 This softly-colored, small-patterned wallpaper did a lot to warm up an all-white work space, without overpowering. In fact, it is more of a backdrop for other elements in the room, than a statement-maker in itself. The top photo shows the first strip going up. I had to do a little tweaking to get the geometric print to look straight against the un-level crown molding and the un-plumb walls of this renovated older home in the Woodland Heights neighborhood of Houston. The second and third photos show how the wallpaper adds just enough color and texture to the space. See how the door and woodwork stand out, with just a little bit of color to set them off? The wallpaper is by Thibaut Designs, one of my favorite brands. The pattern number is T-72614. Interestingly, this design is very similar to one by Quadrille. Quadrille is a brand that comes with a high price tag, as well as a lot of special needs as far as installation goes. My vote is for the Thibaut! The interior designer for the project is Stacie Cokinos. https://www.cokinosdesign.com/ She specializes in selecting and coordinating fixtures, fabrics, and finishes in new homes and in older home renovations. You are currently browsing the Wallpaperlady's Blog blog archives for December, 2017.